Auries o Africae controlled bi European colonial pouers in 1913, shawn alang wi current naitional boundaries. 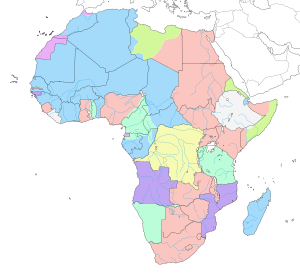 The "Scramble for Africa" (an aa the Parteetion o Africae an the Conquest o Africae) wis the invasion an occupation, colonisation an annexation o African territory bi European pouers in the period o New Imperialism, atween 1881 an 1914. This page wis last eeditit on 21 Februar 2018, at 08:10.